With today’s slow afternoon in the sports world I decided to go back and re-watch the 9thinning of last night’s Red Sox game with the Tampa Bay Rays. If you are a fan of either team, you would know that last night the benches emptied late in the game after Red Sox reliever Franklin Morales drilled Rays’ designated hitter Luke Scott in the leg with a pitch and after being hit Scott started to walk towards the mound before he was intercepted by Sox catcher Jarrod Saltalamacchia. As that was going on, both benches and bullpens emptied for both teams, initiated by players and coaches leaving the Rays’ dugout to come to the defense of Scott. Bench and bullpen clearing incidents, while rare, are not unheard of in baseball and last night’s exchange of words between both clubs may have a lot more to do with bad blood building up between the teams than just the actions in Friday’s game. Luke Scott and Salty after the pitch hit the Rays DH. Division rivals in baseball play each other 18 times per season so I have to think that the benches emptying and the players and coaches standing toe-to-toe with each other and needing to restrained by umpires and some of their more level headed teammates last night was not just about this beaning of Luke Scott. Scott is no stranger to the Red Sox and the fans in Red Sox Nation as he said some inflammatory remarks in spring training about Sox fans being “arrogant, ruthless, vulgar and people who cause trouble” among other things and then calling Fenway Park a “dump” and an “uncomfortable place to come to work”. Like a true politician, Scott backed off some of those comments after last night’s win, but we already know his true feelings. I also have a hard time believing that Franklin Morales intentionally hitting Scott (Morales denied the intention, but be serious, he threw behind Scott with his first pitch of the at-bat and then missed inside 2 more times before hitting him) was just a result of Red Sox second baseman Dustin Pedroia being hit in the back with a Burke Badenhop pitch in the 6th inning of last night’s game. This incident goes much deeper, even if nobody involved will admit it. The 2012 drama between the Sox and the Rays actually started just over a week ago at Tropicana Field. Following the Sox loss to the Rays on May 16, Red Sox first-baseman Adrian Gonzalez predicted that he would hit a home-run the next night. Gonzalez was in one of the worst slumps of his career and his comment was casual and was probably even self-motivation. The Rays did not see it quite the same way. When Gonzalez stepped to the plate for his first at-bat that next night he was drilled with the first pitch he saw by Matt Moore (who claimed his innocence, yeah right buddy). Moore’s teammate David Price, another starting pitcher on the team, re-tweeted before that game a fan’s tweet saying that “Moore should put one right between his numbers” so its hard to accept that this pitched “slipped” too. 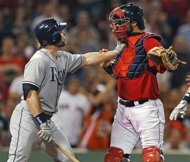 Later that night, Sox starter Felix Doubront hit Luke Scott in retaliation, and that issue should have been over with, but apparently the bad blood wasn’t out of both team’s systems. Very proud of our effort 2nite. What occurred in the 9th reeked of intent. Was ridiculous, absurd, idiotic, incompetent, cowardly behavior. Nobody knows if this episode is finally over, and it should make tonight’s game at Fenway Park interesting to see if the Rays retaliate once again. For the sake of good baseball I hope that nobody gets hit intentionally, but as a fan I do enjoy seeing some of these emotions bubble over. There hasn’t been a great baseball brawl in quite a while, most of these bench clearing brawls are as what Dale Arnold mentioned on WEEI this afternoon “purse-swingers” for lack of a better word. The only thing that we know for certain is that these are two teams that do not like each other, and as someone who watches a ton of American League East baseball I find that awesome. This entry was posted in MLB and tagged Baseball, Boston, Luke Scott, MLB, Rays, Red Sox, Sports. Bookmark the permalink.